The trouble with reading two books simultaneously is that it slows down the finishing. But I have now finished a terrific novel, You Don’t Have to Live Like This by Benjamin Markovits – a sort of state of the United States novel except it seems like another age in this grotesque situation of Donald Trump apparently going to become President. 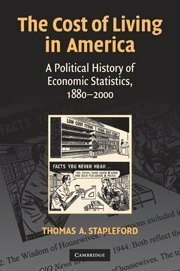 And also The Cost of Living in America: A Political History of Economic Statistics, 1880-2000 by Thomas Stapleford. The title might mark it out as a bit of a niche read – yes, ok – but it is truly a very interesting book. The key underlying message is that all statistics are political, and none more so than a price index. The account is one of the recurring, and recurringly failing, attempts to turn conflicts over the allocation of resources into a technical matter to be resolved by experts. The systematic state collection of statistics is part of the 19th-20th century process of the rationalization of governance as well as being itself “a form of rationalized knowledge making”. Theodore Porter’s well-known Trust in Numbers: The pursuit of Objectivity in Science and Public Life has documented the political appeal of developing and using impersonal, quantitative measures and rules. In my experience, statisticians themselves are far more aware than politicians (or indeed economists) of the highly judgmental nature of their work. The Cost of Living in America presents the history of the development of price measurement in the US, with a division between the labor movement’s emphasis on the standard of living and cost of living, and the increasingly technocratic development of a price index for use in macroeconomic management. The former began with the study of ‘baskets’ of goods and a debate about what working families needed to maintain their standard of living and keep up with the norm. This was affected by context. For example, the price of certain staples including housing rose faster in wartime. New goods appeared. The debate about price indices increasingly revolved around whether to try to measure the cost of a fixed level of satisfaction, or the cost of a fixed basket of goods? By the time of the Boskin Commission, this had been resolved decisively in favour of a constant utility index, the minimum change in expenditure needed to keep utility unchanged. (Robert Gordon has since said the Commission under-stated the over-statement of inflation.) This made accounting for quality change and new goods a pressing issue. Many economists started to agree that the statisticians had not adequately accounted for these in their price indices. Economists including Robert Gordon and Zvi Griliches focused on this question, Griliches developing the hedonics approach. But this is an uncomfortable resolution. Although this elegant solution links national income statistics to neoclassical utility theory, there seems a category mismatch between a set of accounts measuring total production with the idea that value depends on utility. Setting aside the fact that hedonic methods are not applied to a large proportion of consumer expenditure anyway, this piece of statistical welding is coming under huge strain now because the structure of production in the leading economies is being transformed by digital. One of the many consequences of the Brexit vote and Trumpery is that economists (and others) are again thinking about distribution. The issue is usually framed as the distribution of growth – when it is there, who gets it? I think the question raised for our economic statistics is far more fundamental: we need to recognise the normative judgements involved in the construction of the growth statistics to begin with. Actually existing macroeconomic statistics embed a tacit set of assumptions about welfare, and a production structure which is becoming redundant. But that of course is my favourite theme. This entry was posted in Main Page and tagged GDP, review, statistics by Diane Coyle. Bookmark the permalink.